Richard Nixon (1913-1994) was the 37th president of the United States, serving from January 1969 until his resignation in August 1974. Nixon’s foreign policy forged the path to Détente. Under his leadership, the US withdrew from Vietnam, restored diplomatic relations with China and signed an arms limitation treaty with the Soviet Union. Richard Nixon was born in California to a family of Quakers. He was educated at Duke University, graduating in law. Nixon volunteered for the US Navy in 1943, in which he was commissioned as a lieutenant and served in administrative roles in the Pacific theatre. After the war Nixon set his sights on a political career, campaigning for a seat in Congress. He was elected to the House of Representatives in late 1946. In the late 1940s, Nixon was an outspoken critic of suspected communists, sympathisers and unionists. He also served on the House Un-American Activities Committee (HUAC). In 1950 Nixon moved from the House of Representatives to the US Senate. Two years later he received the Republican Party’s nomination as Dwight Eisenhower’s presidential running mate. In November 1952 Nixon, aged 39, became the second-youngest US vice-president in history. Unlike previous vice-presidents he took an active role in foreign affairs, making important speeches and undertaking several state visits abroad. In 1959 Nixon attended an American exhibition in Moscow, where famously engaged with Soviet leader Nikita Khrushchev in what later became known as the ‘Kitchen Debate‘. Nixon served two terms as Eisenhower’s deputy before running for the White House himself in 1960, however, he was narrowly defeated by John F Kennedy and consequently withdrew from political life for several years. Nixon returned from the wilderness in 1968, standing for the presidency and styling himself as a peacemaker who would seek an end to the Vietnam War. Within months Nixon had announced a policy of ‘Vietnamisation‘, aimed at transferring responsibility to the war to South Vietnam and allowing the withdrawal of US combat forces. In secret, Nixon also authorised the expansion of US military operations into Laos and Cambodia, a move that had devastating effects on those countries. Nixon’s Cold War foreign policy called for greater communication with communist powers and contributed to the rising Détente in the early 1970s. In February 1972 Nixon made a historic visit to communist China. The following year he welcomed Soviet leader Leonid Brezhnev on a two-week visit to the US. Nixon and Brezhnev held two summits in mid-1974 that paved the way for future arms agreements and the Helsinki Accords of 1975. The last two years of Nixon’s presidency were tainted by domestic problems, a global oil crisis (1973) and the Watergate scandal. 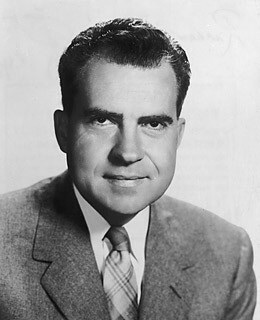 Implicated in a cover-up of illegal activities, Nixon was subject to rigorous investigation and scrutiny. Facing impeachment, Nixon resigned from the presidency in August 1974, the only US president to have ever done so. He spent the last years of his life writing his memoirs and attempting to restore his legacy as president. Nixon died in New York City in April 1994, aged 81. J. Llewellyn et al, “Richard Nixon”, Alpha History, accessed [today’s date], https://alphahistory.com/coldwar/richard-nixon/.